New research suggests that certain types of brain cells may be "picky eaters," seeming to prefer one specific energy source over others. The finding has implications for understanding the cognitive decline seen in aging and degenerative diseases such as Alzheimer's and multiple sclerosis. Studying mice, researchers at the Washington University School of Medicine in St. Louis showed that a specific energy source called NAD is important in cells responsible for maintaining the overall structure of the brain and for performing complex cognitive functions. NAD (nicotinamide adenine dinucleotide) is a molecule that harvests energy from nutrients in food and converts it into a form cells can use. The work appears in two journal articles -- in the May 8 issue of The EMBO Journal, a publication of the European Molecular Biology Organization, and in a recent issue ofThe Journal of Neuroscience. "We are interested in understanding how cells make NAD and what implications that has for cellular function, especially in the context of aging and longevity. We know, for example, NAD levels decrease with age in tissues such as muscle and fat. We wanted to find out if the same is true in the brain." said Shin-ichiro Imai, MD, PhD, professor of developmental biology and of medicine and senior author of both papers. "Neural stem cells are very metabolically expensive, so you might expect them to be particularly vulnerable to loss of an energy source. There are other energy sources for brain cells, such as glucose, but no one had ever looked at where NAD is coming from in these cells." said leading author Liana Roberts Stein, PhD, postdoctoral researcher in Imai's lab. According to the researchers, there are four pathways of NAD synthesis, and the scientists focused on just one. 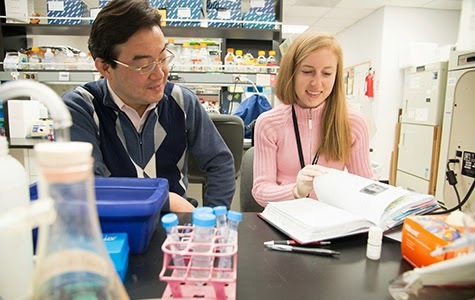 They wanted to find out whether this particular pathway -- a longtime focus of Imai's lab -- is important for these cells or if the other routes could compensate. 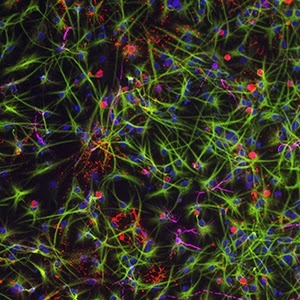 and astrocytes (green), which also support neurons. Cell nuclei are shown in blue. Levels of NAD dropped, and the neural stem cells stopped dividing; they stopped renewing themselves; and they stopped being able to create important cells that insulate axons, the "wires" that carry electrical signals throughout the brain. With less insulation, these signals slow down, impairing brain function. "Scientists have shown that with age there actually isn't a large decrease in the total neuron population. But there is quite a substantial decrease in white matter, which is primarily composed of cells that function in axon insulation. This pathway also could be relevant in conditions involving loss of cells that make this insulation, like multiple sclerosis." Stein said. "We gave the mice NMN in their drinking water for 12 months. And at the higher dose, we saw a rescue of the neural stem cell pool in aged mice." said Stein. "We think that NMN could convey a similar effect in people. A future clinical trial for NMN will tell us if it has any efficacy in humans." said Imai. "The mice were really hyperactive, with a twofold increase in activity levels. They also showed a loss of anxiety-like behaviors. These mice didn't seem to sense or fear potentially threatening situations and showed fairly drastic memory defects." Stein said. Stein pointed out that these neurons are in a region of the brain known to be particularly vulnerable to neurodegenerative conditions from Alzheimer's disease to stroke.